. Published on February 1, 2013 . 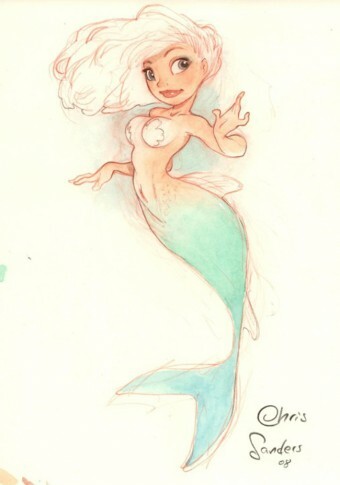 When I was growing up, I wanted to BE a mermaid. I loved everything about them, their lore, their beautiful and mysterious features, and of course, who wouldn’t want an awesome tail to swiftly move you through the oceans deep? I would sometimes wrap a blanket around my legs and “swim” on the kitchen floor or practice my dolphin kick in the bathtub. 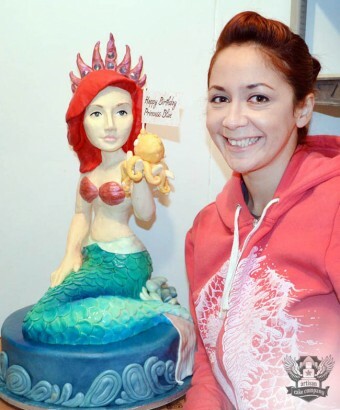 Yes I was just a little obsessed… So when I got my second call to action from Icing Smiles a few months ago to make a princess mermaid cake for a very special girl, I immediately recalled every feeling and memory I had as a mermaid loving little girl and poured it into the design of this cake. Assemble the structure as seen in this photo. Be careful to place your reducing coupler just below where her belly button will be. This is so you can make her lower body out of cake and easily place the sculpted upper body onto the PVC. I’ll explain more later. Just make sure you place your coupler correctly at this point. Attach your pieces together first THEN once you are happy with all the proportions and scale, go through and glue them into place. Do NOT glue the coupler to any of the pipes, this will be how you lift the structure off the stand to put your cake on later. 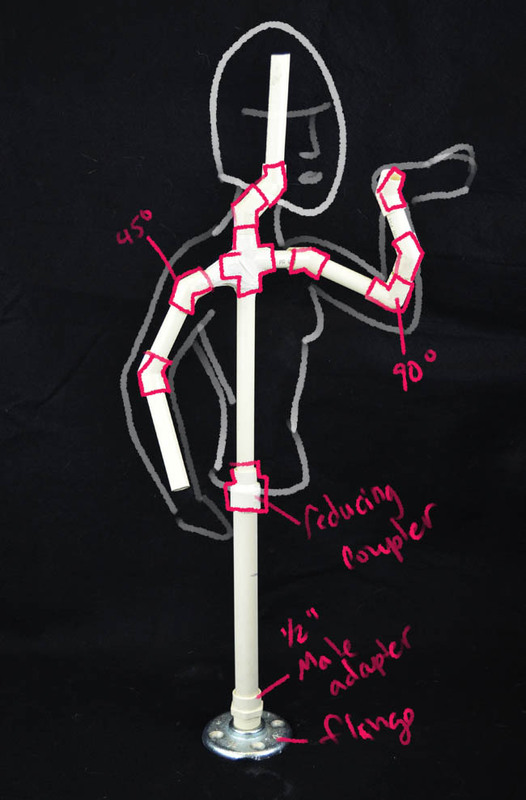 I don’t have exact measurements for arms, neck, torso etc. So you’ll have to pay attention to proportion and scale. Try using your own arms and body to seek out reference points. For instance the length from your shoulder to your elbow is the same length as your elbow to your fist. Torso is about two – two and a half heads high. You can make adjustments depending on how you want things to look. 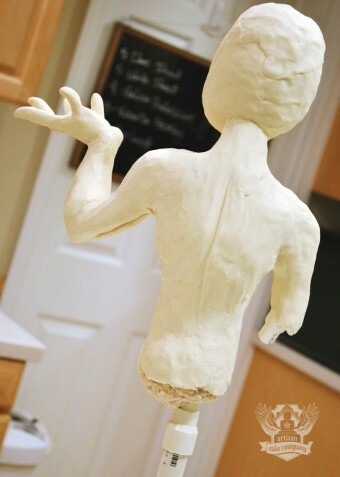 Anatomy is extremely important in sculpting anything. Spend time studying muscle structure and other types of sculptures to help you “see” with your hands when you are making a 3D cake. 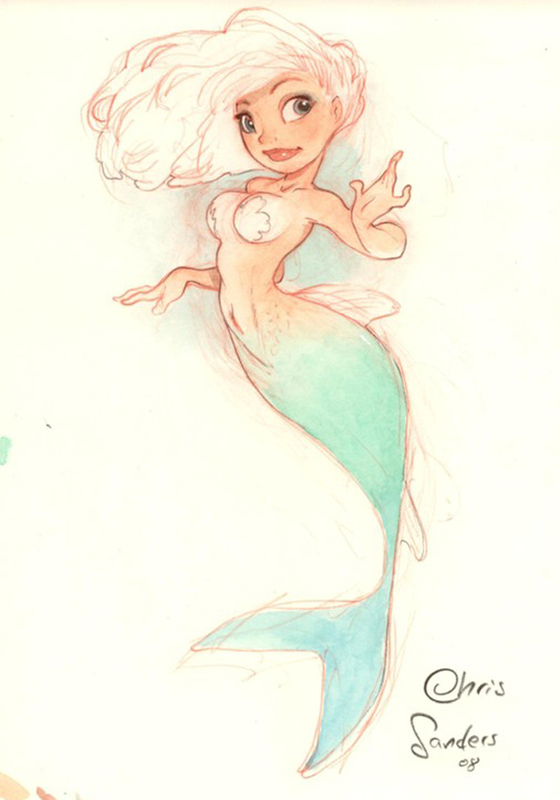 Example, I loved this drawing of a mermaid I found and referenced it often while I sculpted. 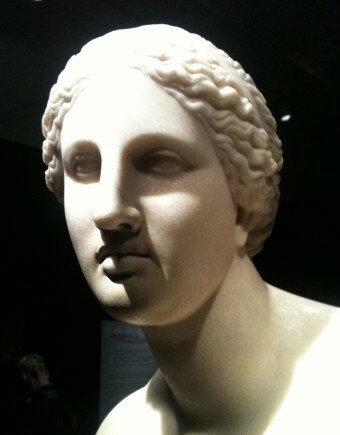 I also referenced several photos of classic greek sculpture to visualize how the neck, nose, eyes and lips would be shaped. 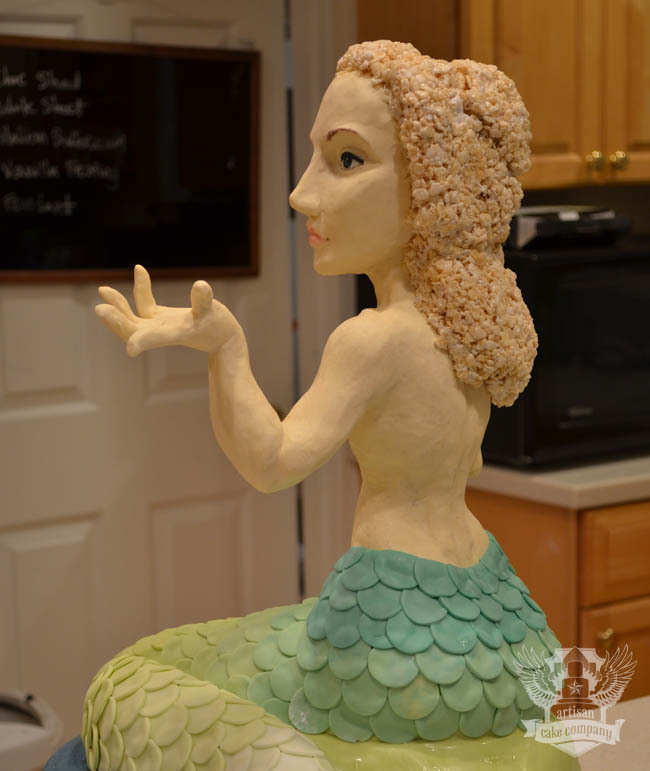 I wanted my mermaid to look anatomically correct, but graceful. Sometimes you can add too much detail to a structure and it ends up looking “creepy” real. 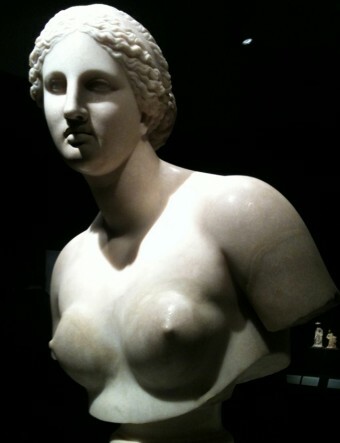 Greek sculptors where known for “smoothing” out small imperfections but you don’t really notice it because of the perfection in proportion and movement in the pose. You can see the shape of the neck, how the chin meets the neck and the tilt of the shoulders give a lot of grace to this piece. 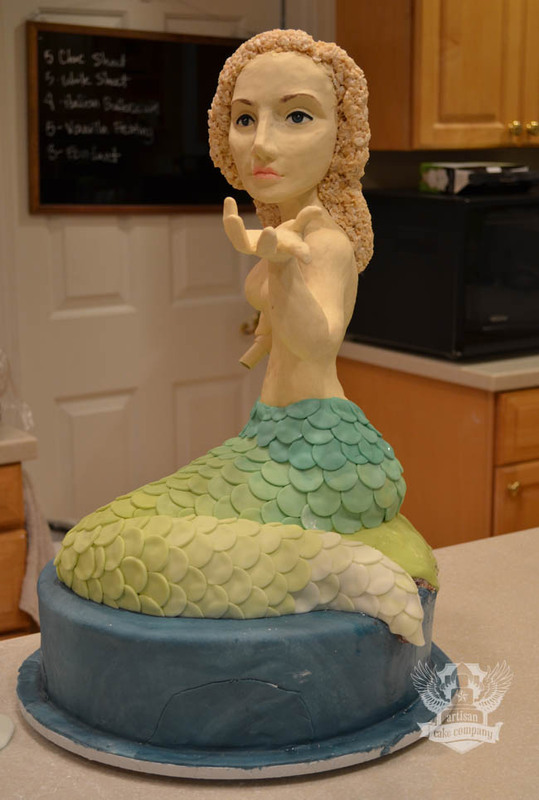 I wanted to mimic that in this mermaid cake. So after assembling my pieces together, I screwed my flange into my board temporarily as I worked. Time to add the RKT (Rice Krispy Treats) to the PVC. Typically, you would not want PVC touching anything you are going to eat, so you would cover it with plastic wrap and tape before adding RKT but I knew this was just for display so I skipped that part. I begin by melting some marshmallows and covering the center part of the pvc with the melted marshmallows to give the RKT something to stick to. Make sure you heat the marshmallows up good and hot so they cool down to a pretty firm texture. Once cool, I melt some more marshmallows and mix with Rice Cereal. I let it set up a bit until it’s almost totally cool before sticking to my PVC pipes. Be careful to not extend the torso below the coupler, this is how we will attach the upper body to the lower body so it needs to stay clear or you’ll be sawing your torso in half Add some copper wire to the PVC “arm” to make fingers and a hand. I keep mine in place with some hot glue. 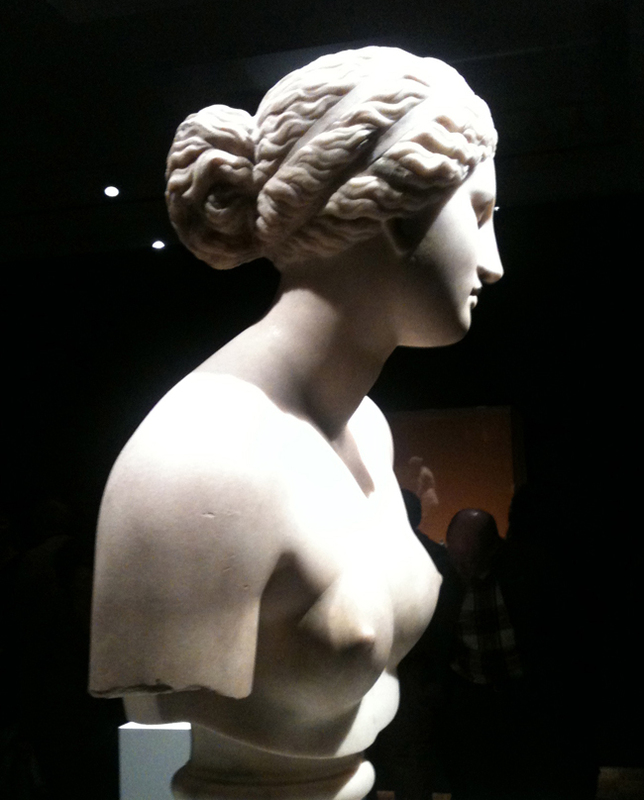 Keep the head, neck and torso pretty small. 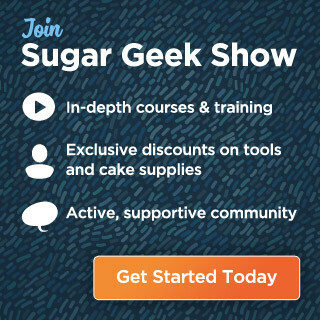 Remember, we are going to be adding modeling chocolate and that will add some thickness. 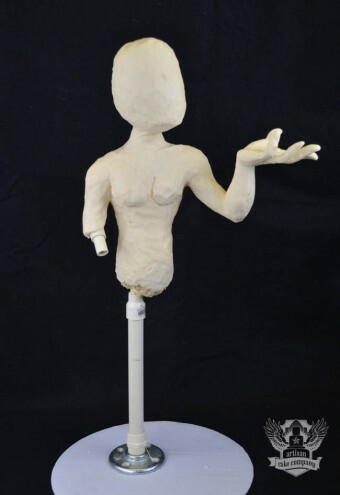 So make the head tall and skinny so you don’t end up with a fat head and body at the end. If you see things are getting too bulky, tear the chocolate off and trim your RKT down with a cake knife. At this point I would stop and let my RKT harden over night or even put it in the fridge to chill. If you are having issues with your RKT falling off, make sure you are heating your marshmallows up a lot and then letting them start to set up before sticking to your structure. You can also wrap the RKT with plastic wrap to sort of “hold” things in place until things firm up fully. While the RKT set up, I take this time to bake my cakes, ice them, chill them and cover them. 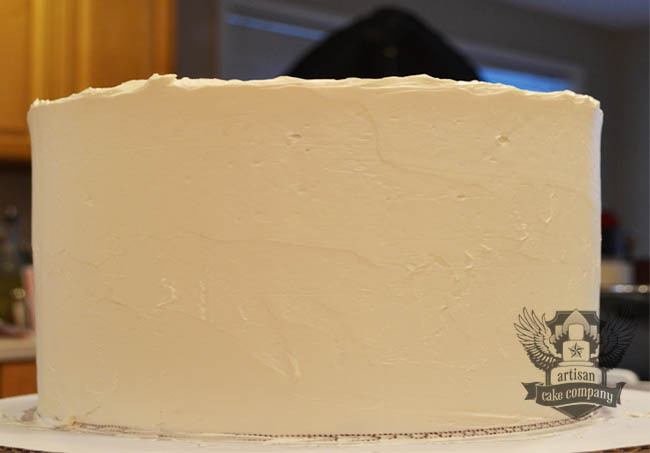 Measure the height of your cake and estimate the height of the fin and trim your 1/2″ PVC pipe that will be inside the cake to meet that measurement. 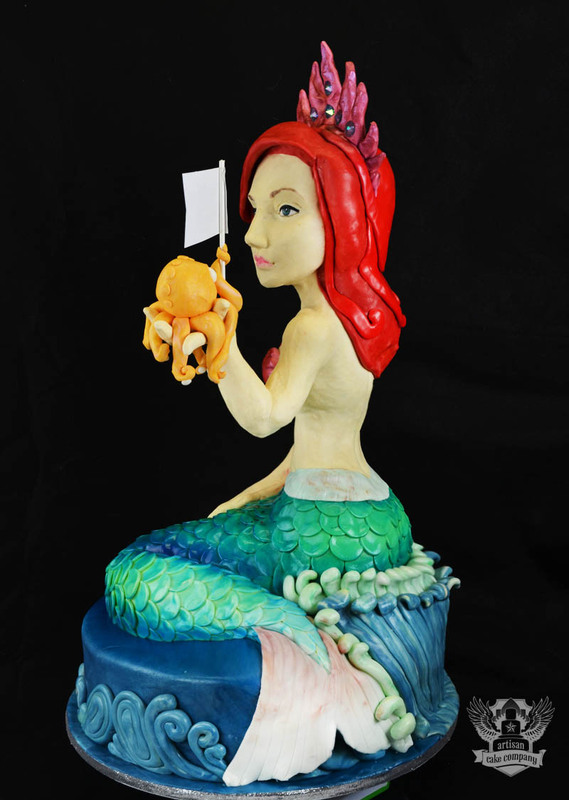 For instance, if your main cake is 5″ tall and you estimate visually that the fin will be about 8″ tall (including the lower hip area) then the 1/2 pipe needs to be 12″ tall. Put the cake in the fridge or freezer to chill before covering with fondant. Don’t put it on the board yet though! 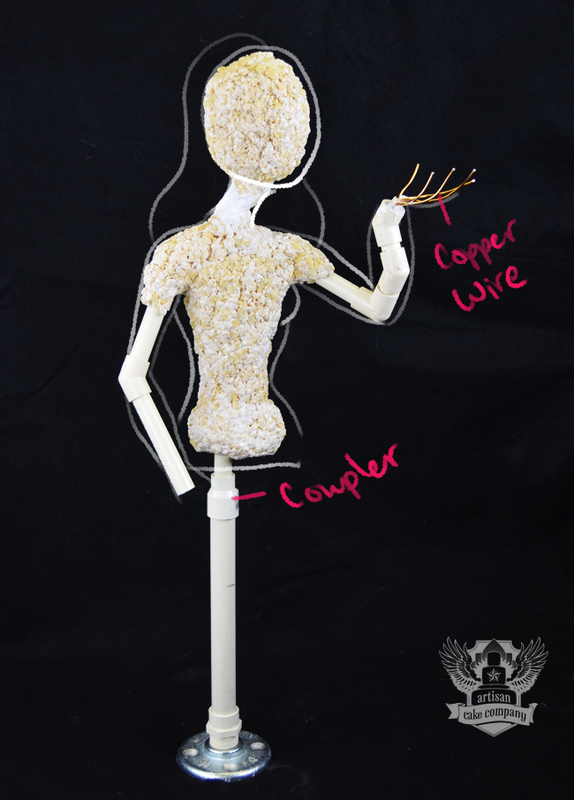 After the RKT are set up, start adding your modeling chocolate. I use mostly this tool to smooth out seams and add definition to the entire piece. This part will take you the LONGEST. It took me two days to slowly build up the body and I had to keep referencing my photos. So this is not a quick project. Take your time and you’ll be happy with the end result. 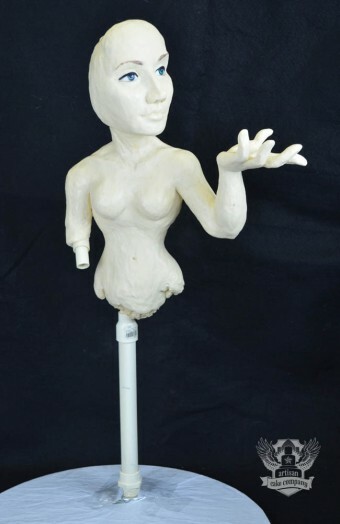 Always remember that the larger the sculpture, the harder it is to make everything look proportionate because small imperfections really stand out. 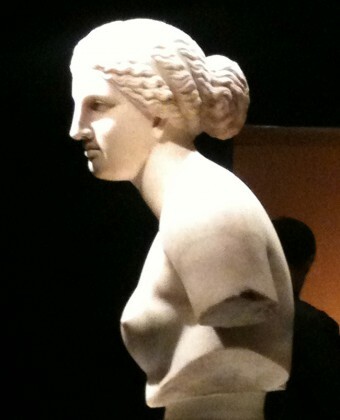 I referenced my greek statues a lot for the face/neck area and my anatomy page for back muscles and arm length. I wanted the hands to have a “comic book drawing” dynamic to them so they are very stylized. You can do yours more realistic if you want. Overall, my mermaid torso was about 18″ tall. 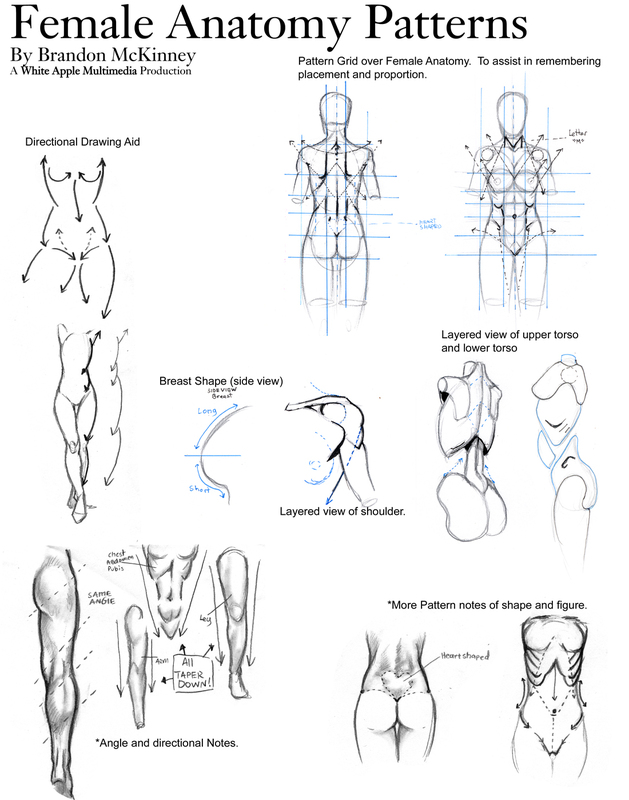 For more great knowledge on anatomy in general (especially in the face) you might want to watch these tutorials on how to draw facial features. They really help me understand the shape of the nose and the lips as well as how eyelids work. For the eyes, I hollowed out a place for a ball of fondant and made sure it wasn’t bulging out away from the face too far. I used edible food color to paint on the iris and the pupil and used white food color for the highlight. 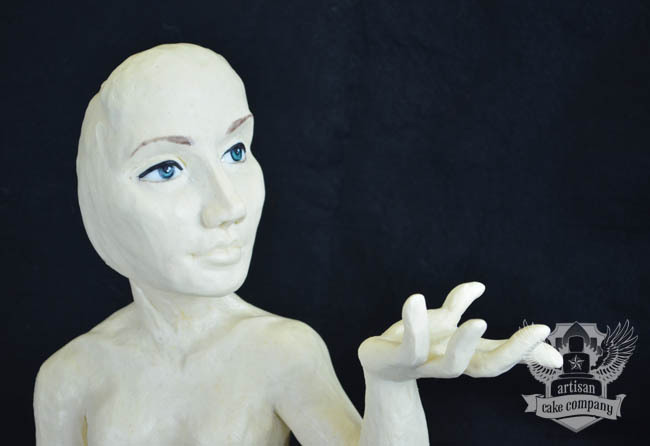 I used more modeling chocolate for the eyelids, being careful to make the eyes level and even. I drew on the eyebrows with a food color pen. Remember, modeling chocolate is oil based so you cant paint regular food coloring on it, you have to use oil based food colors. The eyes should be fine though because they are fondant. Now that the body is basically done, go ahead and gently lift the molded body off the 1/2 pipe at the coupler. Measure out an elongated egg shape onto a cardboard for the fin. Carve out your 1/4″ sheet cakes to make a nice curved shape. 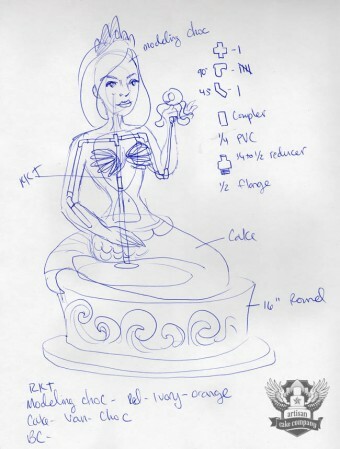 Make sure the height of your cake reaches what you measured out for the height of the pipe so that when you put the torso back on, the cake and body meet together pretty closely. Cover the fin with buttercream and a layer of green fondant and put your torso back onto the pipe. If there is a gap between the bottom of your torso and the cake, fill in with cake scraps mixed with some cream cheese or buttercream (like cake pop filling) and smooth over with buttercream. Add more modeling chocolate if you need to. To create scales, I used a circle cutter and just layered them on top of each other, starting at the bottom of the tail and working my way to the waist. I used more RKT to give shape and bulk to the back of the head and create some hair. I very much simplified the hair so that I didn’t have to spend a ton of time on it. After the RKT set up, I simply covered it in the red modeling chocolate I had prepared. The crown and the octopus are also made from modeling chocolate. 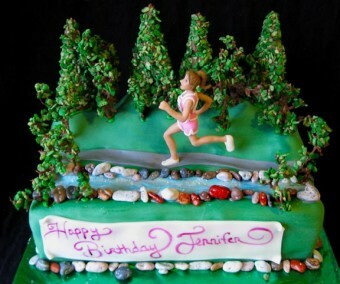 The details around the base of the cake are fondant. Once the fin was finished, I air brushed some color and some depth into the creases and added a little shine. I also continued the right arm down so the hand rested on the fin. Whew! That was a long tutorial! I hoped you liked it and learned a thing or two. Let me know in the comments if you have any questions! I’ll try to help you as much as possible! I’m going to be teaming up with some awesome people in the near future to bring you more sculpting classes in the form of a DVD so definitely let me know what you would like to see! I’m open to suggestions! Here is a pic of my beautiful Icing Smiles girl and her cake on her birthday, which was held at the AWESOME Portland Aquarium. This was a the note from the family. “Baybeblue’s 6th birthday! 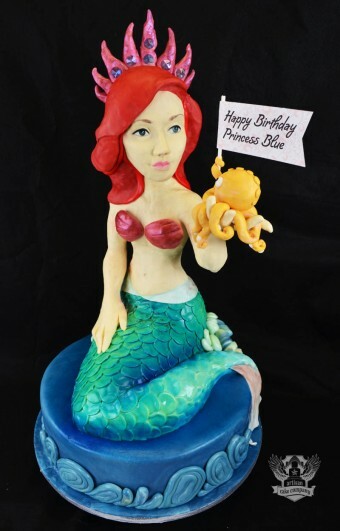 Her party, held at an aquarium, was also a fundraiser with the proceeds donated to Icing Smiles. The mermaid cake sculpted by Elizabeth fit right in with the party theme! Sweet Baybeblue suffers from cerebral palsy, epilepsy, infantile spasm, cortical vision impairment, global developmental delay, and permanent hypercalcemia. She is strong and beautiful and loved by many. She is unable to eat anything by mouth, having to be fed through a nasal g-tube. That doesn’t stop her from tasting things, though – and she loves the taste of frosting! Everyone was thrilled with the cake, and we know Princess Blue loved it! i live in the Caribbean. will modelling chocolate work for me with sculpted cakes? 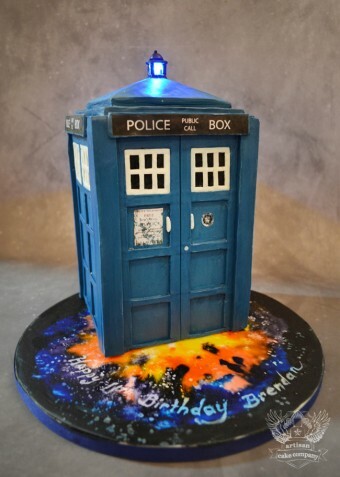 Oh and by the way, your cake is amazing. What do you make the fin and right arm out of? By the way beautiful work! I hope to be as good as you are one day!!! 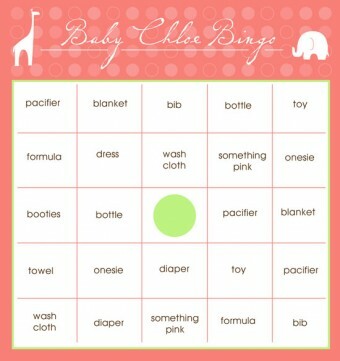 Thank you for sharing this ! If I am half as good as you one day I will be a very happy lady! Amazing tutorial! I really want to try a design like this and your tips are really going to help. Thank you for posting! Did you know that she looks just like you? Wow, amazing work. Thank-you so much for sharing, I definitely learned a lot from your tutorial!! What cake can I use to support a sculpture on top? Awesome job, love it and THANK YOU for taking your time for putting this together and sharing. You are so wonderful! Not only to do this but to share how you did it to help the rest of us. I imagine Princess Blue was awestruck.